Forming a new habit is hard. I don’t have to tell you that. We all know how difficult it is to live a prosperous and healthy life. If it were easy, everybody would do it. We also know that our chance of succeeding is much higher if we start small, right? It’s common sense. “Don’t take on too much in the beginning — you’ll have more reasons to give up.” So goes the advice, which is solid. I’m not going to argue with that. But far too few people actually start small. In fact, I see more people starting big than starting small. Why is that? I think we can get too excited about making a change or doing new things. When we dream about making a change in our lives and start believing in it, the excitement usually takes over. That’s why we end up doing too much too soon. To be clear, I don’t think excitement is bad. You need energy to make a change. And it’s great to be fired up about achieving something in your life. Always remind yourself that you want to stay fired up. Because when things get hard, we can lose that fire. So when you start forming a habit (writing, working out, reading, eating healthy) or learning a new skill, remember that it should not feel like a challenge. The activity should be easy. If that’s not the case, we all procrastinate — even the most self-disciplined people do that. When you start something new, it’s not about your results. When I started writing every day, I couldn’t care less about how many words I wrote. Or when I started getting daily exercise, I didn’t care what type of exercise. I just wanted to make sure I did it. Wrote for 4 minutes? Great — you did it. Went for a 20-minute walk? Great — you did it. Read a book for 2 minutes? Great — you did it. Remember, the action itself is not easy. But as James says, the first two minutes should be easy. And what you’ll find is that you can scale down nearly any habit or activity into a two-minute version. Want to read every day? Read one page. Want to meditate every day? Sit in a meditation position. Want to study for an exam? Open your book. I like this strategy because it nearly makes it impossible to procrastinate. When I look back at all the times I’ve procrastinated, it was always related to getting overwhelmed. When you haven’t even started something, the end result seems a million miles away. That’s how you end up saying, “screw this.” So instead of focusing on the BIG outcome, focus on the SMALL start. Look at what you want to achieve in your life. Then, look at what habits will make that happen. For example, want to be a CEO? Most leaders are readers. So you might want to start a daily reading habit. Then, scale down the habits you need to succeed into a two-minute activity. The goal is not only to get started — it’s to keep going. Nobody wants to read one page a day for the rest of their lives. 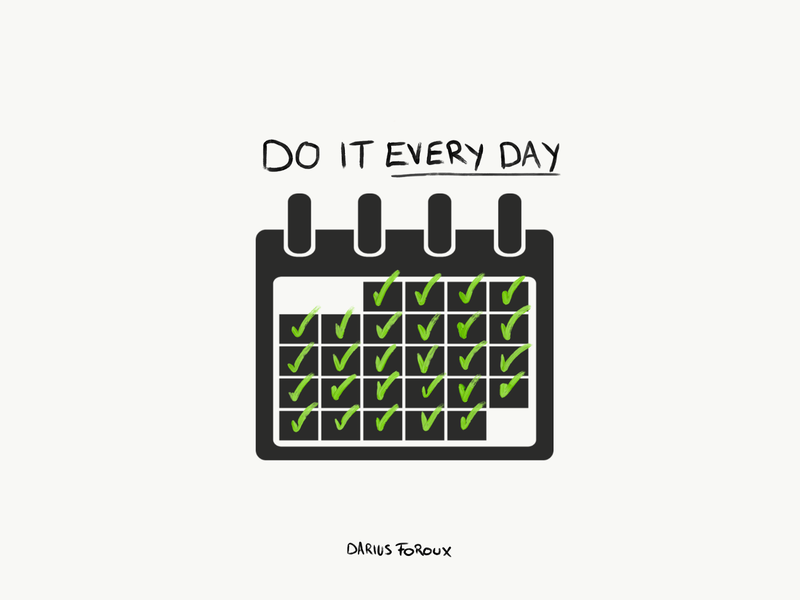 To me, this strategy is all about getting used to doing something every day. Look, changing your lifestyle is not an easy thing. Let’s say you’ve been living in a certain way for 30 years. What do you expect? That you change overnight? You and I both know that it takes time. So we should change our perspective accordingly. Your first priority should always be to form the habit — something you do regularly. And remember: Habits are not about results. No one cares about how many pages you’ve read, how hard you’ve worked out, or how long you haven’t smoked a cigarette. You should only care about what you did today — and don’t focus on metrics. Life is a competition with yourself — not others. And if you want to win, you must make it easy for yourself.